General Motors said Tuesday that it had struck a preliminary deal to sell Saab to Spyker Cars, a tiny Dutch maker of high-end sports cars, saving the Swedish automaker from what seemed like certain extinction after previous bids for it collapsed. Even so, taking over Saab will be a huge leap for tiny Spyker, which sells 30 to 50 made-to-order cars a year for about a quarter-million dollars each. In 2008, Saab produced more than 90,000 cars. Saab has 3,400 workers, mainly in Trollhattan, while Spyker has just 110. Well, it looks like Saab is now rock solid. Up until the tank falling out of the airplane part, this actually didn’t look too cheesy. If they’re going to do cheesy, they should whip out the “cabbage gun”. You can see the “cabbage gun” at minute 41 in the hulu video of the A-Team, season 2, episode 8 “Labor Pains”. American Express Co., the biggest U.S. credit-card issuer by purchases, said fourth-quarter profit more than doubled amid a surge in customer spending and lower expenses for future defaults. Not coincidentally, the interest rate on my American Express Delta Skymiles card jumped in December from 11.25% to 14.5% a nearly 29% increase. This is for new purchases and existing balances. Congress is fighting against this type of increase on balances, but the credit cards are making changes before the law takes place. The law, among other things, would prevent card companies from raising rates on existing balances unless the borrower was at least 60 days late and would require the original rate to be restored if payments are received on time for six months. The law would also require banks to get customers’ permission before allowing them to go over their limits, for which they would have to pay a fee. I think any legislation should include a roll back of interest rates to a point before these rate increases have been implemented. Otherwise the intent of the legislation would be lost. It’s like closing the barn doors once the cows have gone. Battlestar Galactica’s “prequel” Caprica premieres tonight 9PM on the Syfy Channel. The story takes place 58 years before the events of Battlestar Galactica and follows the development of the Cylons and the decay of human society. Cincinnati.com: Where Should Diners, Drive-ins and Dives Visit Here? Looks like Food Network’s Diners, Drive-In’s and Dives is coming to Cincinnati in March. Besides Terry’s Turf Club, I can’t imagine where else Guy Fieri would go? Whenever I watch the show, I’m always wondering why we don’t have restaurants like this in Cincinnati. The thing that I notice about the restaurants featured is a passion for their food and their ability to far exceed the expectations of their customers. Jimmy Kimmel’s take on “the Late Night Wars”. FederalTimes.com: For sale: Space shuttles, slightly used, bargain price! From FederalTimes.com: For sale: Space shuttles, slightly used, bargain price! $28.8 million sounds a lot for a museum piece, but paintings have sold for nearly 5 times more. Still, it’s difficult to imagine that any science/air museum will be able to afford the costs of purchasing and exhibiting a space shuttle in this economy. China only allows 20 foreign films a year to be shown in theaters. Industry analysts say China Film Group Corporation, a state-run enterprise, heavily influences if not controls decisions on how long and where foreign firms are shown. David Wolf, the president and chief executive of Wolf Group Asia, a corporate consultancy based in Beijing, said that Chinese officials were apparently curbing the run of “Avatar” because they wanted to protect the box office returns of domestic films. He said “Avatar” has already run longer than the typical 10 days allowed for foreign films. When I read this article, I thought it was another article about Chinese censorship. But, the reason Avatar is being pulled is to protect the Chinese movie industry. Why is it that the Chinese are able to protect their industries while we allow whole sections of American industry to disappear? Just yesterday, there was a story in the NYTimes: Glassmaking Thrives Offshore, but Is Declining in U.S., that describes the decline of the American glass industry and the fact that the new World Trade Center building in NYC will have its lower floors sheathed with glass from China. A story about American Samoa and how it produces so many NFL players. Features a short interview with Bengals players Jonathan Fanene and Domata Peko. This is my yearly reminder that you can save money on MobileMe by purchasing it from Amazon.com. 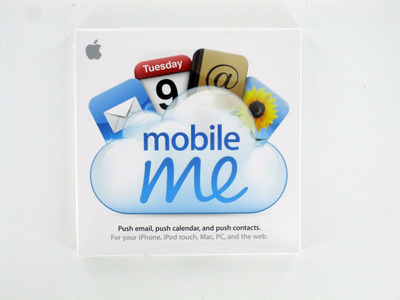 My MobileMe was set to expire this week so last week I picked it up for $71.99 with free shipping. What you get from Amazon is a small cd sized box. 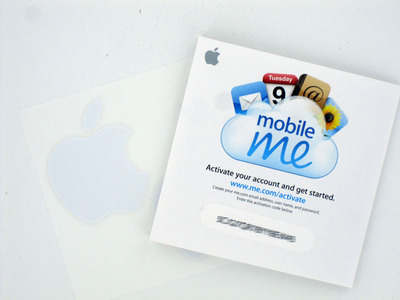 Inside the box there’s a couple of white Apple stickers and a sheet with the activation code that you enter at http://www.me.com/activate. By buying from Amazon, I saved $27.01.